The amination of undecanal with hydrogen is a fast reaction. The effective rate of reaction may therefore be limited not only by the reaction kinetics but also by the transport of the gas through the liquid phase. Project A10 investigates the rate-limiting steps of mass transport and reaction for a gas component in reactive, catalyst-containing novel solvent systems. The mass transport in these systems is complex due to the multiple phases, phase interfaces, and transport pathways. Project A10 quantifies the volume-specific mass transport coefficients (kLa) in micellar solvent systems, thermomorphic phase systems, and Pickering emulsions. Using a stirred-tank at the TU Berlin equipped with an endoscope for observing gas bubbles, the mass transport in stirred systems will be investigated and the influence of process parameters such as pressure, temperature, composition, stirring speed, and gas flow rate will be observed. 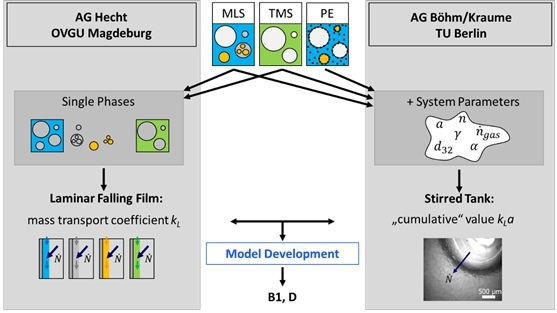 At the Otto-von-Guericke University in Magdeburg, the mass transport rate into the individual phases of thermomorphic phase systems and micellar solvent systems will be quantified. Due to the well-defined laminar film, the mass transport rate can be broken down into one parameter which is the gas/liquid interfacial area (a) and a second parameter (kL) that depends on the rate of transport of the gas through the gas/liquid interface. The goal of the project is to develop a fundamental understanding of gas/liquid mass transport in the reactive phase systems being considered in SFB/TR 63 and to provide a model that can describe the various transport pathways among all of the phases involved.